To one generation Frank Sinatra was an academy award winning actor. To another he was a record label owner and recording star. In the two decades prior to his death he was a Vegas legend and American musical icon. But to the Bobby Soxer generation of the 1940’s he was what Elvis was to the 1950’s and the Beatles were to the 1960’s. During the first half of the 20th century radio dominated home entertainment and it helped make Sinatra an enduring star. 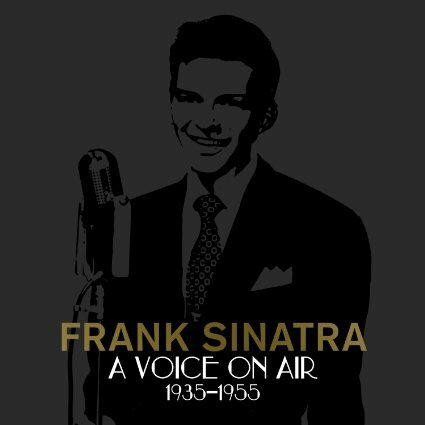 Now, Legacy Recordings has released a massive 4-CD box set containing 100 rare and previously unreleased performances from his radio years titled A Voice On Air: 1935-1955. The tracks are presented chronologically beginning in 1935 with “Shine,“ recorded with the Hoboken Four, and ending in 1955 with tracks from The Frank Sinatra Show, including “Sam’s Song,” “Half As Lovely (Twice As True),” and “Our Love is Here To Stay & Put Your Dreams Away. “ In between are 96 more performances that trace the career and vocal development of on one of America’s most important musicians. By my count there are 88 previously unreleased tracks, which is a lot of unheard Sinatra. Some highlights include “America The Beautiful” recorded right after D-Day, “You Are My Sunshine” with Gov. Jimmie Davis,” “Who’s Sorry Now,” “Don’t Marry That Girl,” “Exactly Like You” with the Nat King Cole Trio, “Take Me Out To The Ball Game” with Doris Day, and “You Brought A New Kind Of Love To Me” with Peggy Lee. The recordings have been restored and remastered in high-resolution from the original radio transcription discs. Radio was not the best quality listening experience but now they have a crystal clear sound. Their transformation is amazing and a testament to modern day technology. The accompanying 60 page booklet contains several informative essays, a personal remembrance from Nancy Sinatra, plus information and pictures. My only complaint is the size of some of the print, plus the fact there are pictures printed over some of them. It makes for very difficult reading and in some cases virtually impossible. Frank Sinatra still has a huge fan base and this this new set fills in a lot of gaps in his career and music. A must for any aficionado of The Chairman Of The Board. Sinatra always had a unique and intimate style and his ability to interpret a song was on display with “Learning The Blues.” It stalled at number two on BILLBOARD’S Best Sellers In Stores Chart and Most PlayedIn Jukeboxes Chart. The good news was on July 9, 1955, it began a two week run at the top of the Most Played By Disc Jockey’s Chart. Sinatra would re-record the song for his 1963 SINATRA-BASIE album. The Concord Music Group and the Sinatra Family have been re-releasing the Reprise Label Frank Sinatra catalogue in recent years. The latest entry is his 1963 album, The Concert Sinatra, which now returns in a pristine, remastered form. The title is somewhat misleading as it refers to a concept rather than an actual concert album. Arranger and conductor Nelson Riddle gathered a large orchestra in the recording studio in order to create a concert sound and experience. While his flourishes on a number of the songs were a bit much, it remains one of the strongest and most pleasurable albums of Sinatra’s career. The original album contained only eight tracks, four of which were co-written by Richard Rodgers and Oscar Hammerstein. Two more were composed by Rodgers and Lorenz Hart. Most are show tunes that formed the core of many of Sinatra’s albums during the 1960s. He was above all an interpreter of songs, and this type of material was made for him. While the record produced no hit singles, “I Have Dreamed” was probably the most popular track at the time of its release. It was from 1951’s The King And I, and Sinatra gets the phrasing just right with a swinging performance. Sinatra had worked as a conductor for Peggy Lee during 1957 and one of the songs they recorded together was “My Heart Stood Still.” Here, he records his own version that builds slowly as the tempo and vocals increase throughout. “Lost In The Stars” was the title song of a 1949 Broadway musical and it was a fine example of Riddle’s arranging ability that made clear why Sinatra returned to him again and again. Two songs from the Great American Songbook form the center of the album. “Ol’ Man River” remains the album’s most sophisticated track, as he gets the phrasing and tone perfectly. Sinatra recorded “You’ll Never Walk Alone” in 1945 and then didn’t sing the song again for 18 years. He re-interprets it here as a type of lullaby with an emotional performance. “Bewitched” was from the early 1940s musical Pal Joey, and Sinatra gave it a breezy interpretation on this album. “This Nearly Was Mine” featured his voicing recorded within the orchestration, and “Soliloquy” was a rambling eight-minute track that remained a part of his stage act until the end of his life. Two bonus tracks appear on the release. In late 1962, Governor Pat Brown asked Sinatra to create a new song for the state of California. He approached songwriters James Van Heusen and Sammy Cahn and the result was “California.” It was recorded during the session for the album but pulled from the song line-up at the last minute. It was distributed to attendees at a state function as a limited 45 rpm single with a special cover. Now, it returns to the album for which it was recorded. His version of “America The Beautiful” was recorded at about the same time and while it was a spectacular rendition, the second chorus with a 24-voice choir makes it a little out of place. The Concert Sinatra remains an essential listen for any fan of the chairman of the board or popular music. It’s nice to have the album back in circulation. Article first published as Music Review: Frank Sinatra – The Concert Sinatra [Remastered and Expanded] on Blogcritics. The song, “To Each His own” was number one eight weeks by three different artists. Right is the middle of this unusual string of number one hits came Frank Sinatra. His single, “Five Minutes More,” reached the top of the singles chart on September 14, 1946 and remained in that position for two weeks. Even though it was a solo release, it had a big band sound. The orchestra was led by Axel Stordahl. It may not have been one his well-known hits but it did reach number one. The Concord Music Group, in conjunction with Frank SinatraEnterprises, has been reissuing the Frank Sinatra Reprise label catalogue. Their latest release gives you two albums for the price of one. Both of his albums with Count Basie, 1962’s Sinatra – Basie: An Historic Musical First and 1964’s It Might As Well Be Swing have been combined onto one CD release. Frank Sinatra & Count Basie: The Complete Reprise Studio Recordings was released September 13, 2011. When Sinatra and Basie went into the recording studio together, they were already giants of the music industry. Basie’s career began during the mid-1920s, and by the mid-1930s he had assembled his first band. At the time of his death during 1984, Basie had become one of the respected and legendary band and orchestra leaders in American music history. Sinatra became a music idol as the lead singer with the Harry James Orchestra (1939-1940) and the Tommy Dorsey Orchestra (1940-1942). His solo career lasted from 1942 until near his death in 1998. He sold millions of singles and albums and was recognized as an American icon. Count Basie and Frank Sinatra were a perfect match, as the band leader and the singer complimented each other in style, sound, and professionalism. Sinatra easily fit into the singing style of Basie’s band, as the majority of the material is presented in a relaxed and swinging tempo. Both artists were masters of phrasing and tempos but from different viewpoints. Basie was accomplished and wise enough not to intrude on Sinatra’s vocals. His band filled in the gaps and provided the intros and escapes. Their material achieved a balance of power that was rare for two musical superstars. Basie was one of a very few artists who matched Sinatra’s flexibility. Sinatra had a style that could not be imitated and many times interpreted songs by feel, rather than any formalized advance planning. Basie and his band were able to adapt as they went along. The material was typical of most Sinatra albums as songs from the Great American Songbook shared the limelight with those from films and a few modern favorites. Songs such as “Pennies From Heaven,” “I Only Have Eyes For You,” “I’m Gonna Sit Right Down And Write Myself A Letter,” “Fly Me To The Moon,” “The Good Life,” “I Can’t Stop Loving You,” and others all succumbed to the unique Basie/Sinatra combination. Sinatra had recorded some of the songs previously but here they took on new dimensions and textures. The sound is crisp and clear, which enhances the listening experience from previous reissues of this material. Bill Dahl wrote an essay of the history of the music, which is included in the accompanying booklet. An informative interview with Quincy Jones, who provided the arrangements for the It Might As Well Be Swing music, is also included. Frank Sinatraand Count Basie will not pass this way again and so we are left with these two albums worth of music. Frank Sinatra & Count Basie: The Complete Reprise Studio Recordings is a fitting tribute to one of the better duet projects of the era. Article first published as Music Review: Frank Sinatra and Count Basie – Frank Sinatra & Count Basie: The Complete Reprise Studio Recordings on Blogcritics. Frank Sinatra became a mega-star during the 1940s both as a solo artist and as the featured singer of the Tommy Dorsey and Harry James big bands. He solidified his popularity during the 1950s with a series of studio albums, which sold tens of millions of copies, for the Capital label. As the 1960s dawned, he tried to purchase the Verve label. Rebuffed in his efforts, he decided to start his own label, and thus Reprise Records was born. It would be his music home for the rest of his career. The Concord Music Group has been issuing his Reprise catalogue, complete with bonus tracks. The latest entry is his first release for the label, Ring-a-Ding-Ding, which was issued in March of 1961. It would continue his commercial popularity by reaching number four on the Billboard Pop Album Chart. The original idea was to issue an album without ballads, which was very close to the concept that Capital had used to put together Sinatra’s Swingin’ Session, which they had issued two months previous, after he had left the label. The music comes very close to returning Sinatra to the big band idiom of the 1940s. It is finger snapping light jazz, with a beat. While Jimmy Van Heusen and Sammy Cahn wrote the title song specifically for the album, Sinatra mainly recorded older songs from the Great American Songbook. Even though “Ring-a-Ding-Ding” was the newest song, the blaring horns and the upbeat rhythms set the tone for the rest of the album. Most of the material was taken from the 1930s. Ira and George Gershwin’s “A Foggy Day” was originally written for the Broadway play, A Damsel In Distress.Here Sinatra resurrects the song as a light jazz classic. The song would appear on five of his albums down through the years. Listening to his interpretation of “Let’s Fall In Love,” one can immediately discern why he was considered a master of diction. “You and the Night and the Music” was from a failed Broadway show, but it would become a jazz standard. Sinatra gives a relaxed and informal performance. The best track is the old Cole Porter tune, “In the Still of the Night.” It was a Tommy Dorsey standard, and here Sinatra performs it in the big band tradition, complete with brass and heavy percussion. Ring-a-Ding-Ding was a fine debut for Sinatra’s fledgling label. He would go on to use Reprise to explore a variety of styles and issue creative duets projects across a number musical styles. Here, it is the swinging Sinatra at his best. Article first published as Music Review: Frank Sinatra – Ring-a-Ding-Ding on Blogcritics. 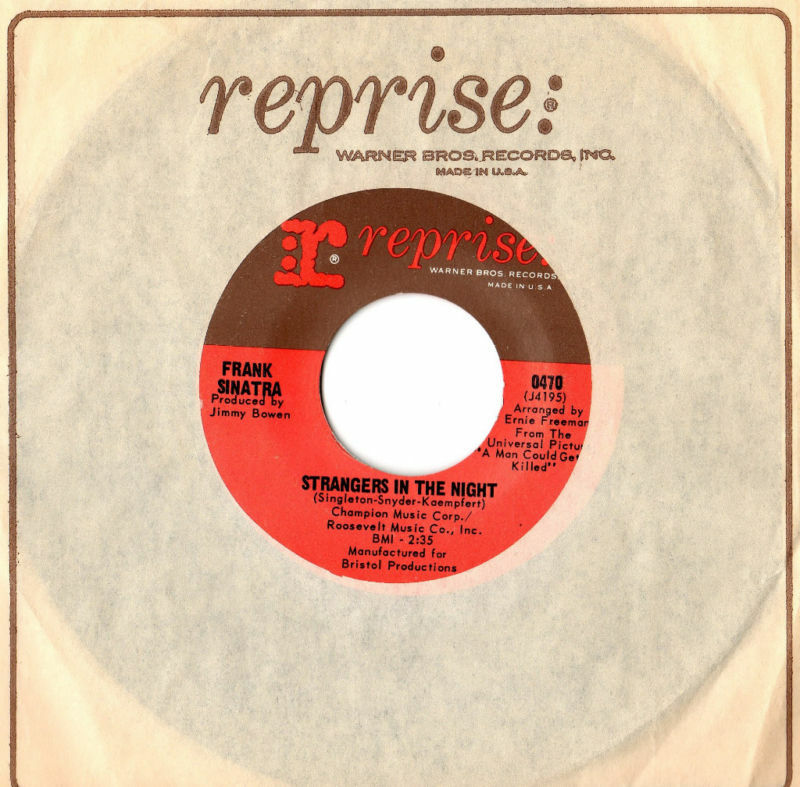 Frank Sinatra was in his early 50’s when he released “Strangers In The Night” on May 7, 1966. He may have been far from his teen idol years but he was still one of the most popular singers in the world . “Strangers In The Night” would be his last solo number one single. It was a smooth performance in the Sinatra tradition and a surprise big hit at the time during the mid sixties. The Chairman Of The Board proved he still had it! You are currently browsing the archives for the Frank Sinatra Reviews category.